Stepper motors are controlled by a PLC or industrial computer for the purpose of positioning equipment. Unlike the more precise closed-loop Servo Motors, the lower cost Stepper Motor is an open-loop system requiring precise initial programming, and stable application dynamics. In general, holding or positioning are prime applications. These might include the positioning of linear or rotary actuators in the printing and packaging industry. Other applications include CNC milling machines, and 3D printers. A Stepper Motor system is comprised of an interface like a computer or a programmable logic controller known more commonly as a PLC, a specialized micro-processor called an indexer that generates directional pulse signals, and the stepper motor itself. The motor converts the indexer's pulse signals into the mechanical movement of shaft rotation. 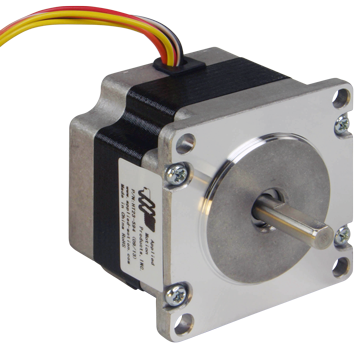 Compared to the more precise, but expensive Servo Motors, a Stepper Motor has a much lower price, generates high torque even at low speeds, and is more rugged allowing it to function well in almost any environment. HTE Automation supplies Stepper Motor Systems to companies in Kansas, Missouri, and Illinois.